Welcome to Impressions On Market – where customer service is a philosophy, not just a saying. 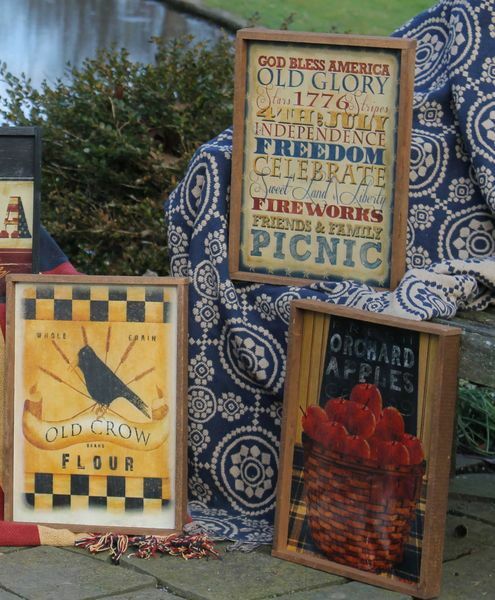 All items are manufactured in the U.S.A. at our shop in beautiful Lancaster County, Pennsylvania. Handcrafted with pride and printed on wood, our large sign are framed in brown or black tobacco lath (or select painted sides) and include a sawtooth hanger or display as a shelf sitter. Box signs have painted edges for display on wall or table décor. We ALWAYS have your item "in stock" and never run out! You don't have to tie up your cash flow, be bogged down with slow-moving inventory or risk purchasing too much for fear of not being able to re-order - we can have you restocked in a jiffy! We look forward to being your new favorite supplier! Minimum Order: $100 - Please allow 2 to 3 weeks for us to get your wood signs ready for you. Purchase $165 worth of product and receive 2 additional pieces you select for FREE! The free pieces will be of equal of lesser value and have a market value up to $70 MSRP! We will adjust the final price to reflect the free items. For orders totaling $250 or more, you receive half price shipping; for orders totaling $500 or more, you receive FREE SHIPPING! THAT'S A HUGE SAVINGS! And this is in addition to the 2 Free Pieces you will receive!